The most talked-about part of General Growth Properties’ recent presentation to the Landmarks Preservation Commission of a proposal for a mixed-use development at South Street Seaport doesn’t even fall under the LPC’s jurisdiction: A 495-foot-tall hotel/condo tower that is the most visible part of SHoP Architects' design for GGP sits just outside of the historic district. 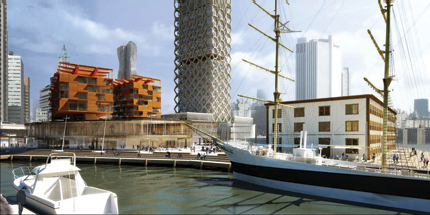 What was on the agenda at the spirited October 21 hearing, however, was the overall appropriateness of the project—which includes four two-story retail buildings, a department store, and other uses on Pier 17—along with a proposal to relocate the Tin Building, the only historic structure in GGP’s plan. And so with the tower looming over the proceedings, the rest of the hearing revolved around the relocation of the historic Tin Building and the overall merits of the project. GGP’s proposal for the Seaport involves removing the 1982 mall and replacing it with a series of smaller buildings for retail and hospitality, moving the Tin Building to the edge of Pier 17, and building the residential and hotel tower. 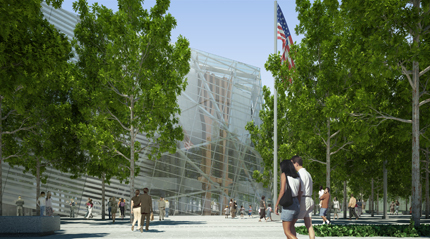 The new construction would sit in a series of public spaces and promenades. 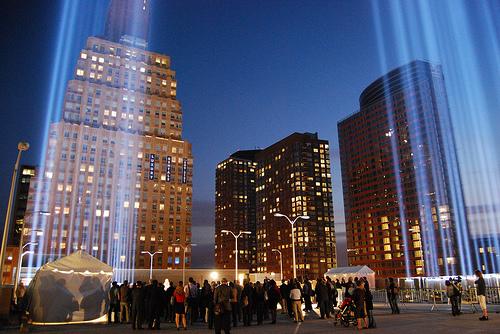 The designers argued repeatedly that moving the Tin Building to the end of the pier and out from under FDR Drive would not only give it pride of place within the new development but restore it to its rightful historical site on the waterfront, which was blocked when Piers 17 and 18 were filled in to make way for the mall. “The significance of historic buildings partly resides in their historic context, which, over the years, has been lost to the Tin Building,” said Elise Quasebarth, principal of preservation consultancy Higgins & Quasebarth. Moving the building would also allow for a seamless connection to the East River Esplanade, another SHoP project. The Tin Building was heavily damaged in a 1995 fire, and little of the existing structure is original. The team argued that this meant there is little of true historic value to displace. “The property owner’s and our intent is to take unprecedented steps in the recreation of the building,” said Richard Pieper, director of preservation at preservation architects Jan Hird Pokorny Associates. Some also pointed to the dangerous precedent such a move could set. “Simply put, a building in a New York City historic district has never been relocated,” Simeon Bankoff, executive director of the Historic Districts Council, said. He noted that a handful of individual landmarks had been moved to prevent their demolition, but never to satisfy a developer, something he and others said would become common practice if it were allowed here. After the hearing, Gregg Pasquarelli, a principal at project architect SHoP Architects, told AN that it was about striking the right balance between reverent preservation and a successful plan to revive the neighborhood. “It’s a matter of understanding the trade-offs,” he said. In the end, the project may come down to a question of economics. The development team, whose proposal has the imprimatur of the city’s Economic Development Corporation, said that it does not wish to ignore the seaport’s historic value, but that something must be done to revive it and make it enticing to locals as well as tourists. “The South Street Seaport has been an underutilized part of Lower Manhattan for years, slowing its growth and holding the area back from the renaissance it deserves,” said John Skillman, a representative of the Partnership for New York City. Skillman and others said the new development would offer much needed amenities, like grocery stores and locally owned businesses, cultural and recreational space, and a Bryant Park–sized public plaza adjacent to the Tin Building. 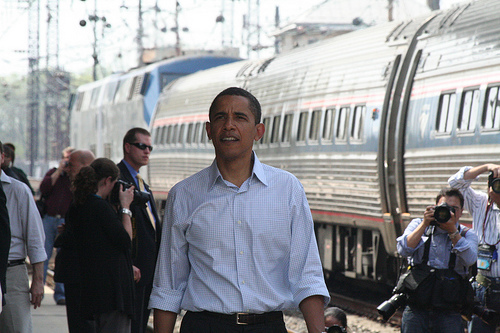 Barack Obama is one of a growing number of U.S. politicians who support increasing the nation's use of mass transit. But the most significant part of the bill may not yet be on the books: Congress’ growing interest in funding mass transit. With the five-year surface transit bill, which funds 95 percent of transportation infrastructure in the country, due up for reauthorization next year, the nation could be looking at a landmark shift in where and how it travels the country. “We think, and we’re getting reception for this on the Hill, too, that the 1950s highway-based transportation system has run its course,” said Daniel Goldberg, communications director for Transportation for America, a mass-transit and transit oriented development group. As gas prices skyrocketed over the past year, mass-transit ridership increased by more than 5 percent, a record expansion, according to the American Public Transportation Association. Though oil has tumbled recently, in step with the rest of the economy, politicians and the public are increasingly aware of factors like congestion and the environment that should continue to boost support for mass transit programs at the federal level. Though Congress may be more concerned at the moment with the saving Wall Street and Main Street than the streets themselves, transit advocates like House Transportation Committee chair James Oberstar have expressed a commitment to pushing the surface transit bill in new directions. “Chairman Oberstar has said he’s not going to break the mold on this bill, but he’s certainly moving away from past models and trends,” Jim Berard, the committee communications director, said. Another pothole is all the potholes. The nation’s physical infrastructure is crumbling, made fatally clear by last year’s devastating bridge collapse in Minneapolis. With both transit and infrastructure programs drawing from the same trust fund, it could create a shortage for both. Money is on everybody’s mind, but we just had a dizzying experience that provided some consolation regarding how little of it we have. The launch party for this year’s Open House New York was held at the penthouse of Enrique Norten’s almost-complete One York, right at the edge of the scenic Holland Tunnel. We went to go take in the views on the glassy 14th-floor terrace when we were struck with a bout of vertigo so strong we were rendered speechless. We put on our best grimace-grin, gripped the wall, and tried a little liquid courage of the merlot variety, but to no avail. We think we saw MoMA’s Barry Bergdoll making the rounds, and Norten himself was apparently moving in that same day, but it could have been the googly eyes. For the sake of the future inhabitants, we hope the apartment’s $37 million asking price includes a lifetime supply of Dramamine. Well, at least a really swirly tie: Congratulations to Gia Wolff and John Hartmann, who got married on a recent sunny Sunday afternoon in Brooklyn. Wolff, who works at David Adjaye’s New York office, and Hartmann, a partner in the Dumbo firm Freecell, were cheered on by family, friends, and colleagues including Vito Acconci, the groom’s partner Lauren Crahan, the bride’s uncle David Wolff (a London architect working on Madonna’s house there), artist Allan Wexler, designer Jonathan Jackson, and Giuseppe Lignano and Ada Tolla of LOT-EK. Other than a very elegant and spare huppah, the only giveaway that these nuptials were heavy on the architecture were the home-made centerpieces featuring a spinning globe of chrysanthemums lit by an LED mesh. There was some puzzlement as to what, exactly, they were: hidden video cameras that would take movies in the round? Mobile breathalyzers? They were just decorative, however, which suits us fine: At the end of the evening, we made off with three of them. Send tips and Jordan almonds to eavesdrop@archpaper.com. New gallery Haunch of Venison's painted white brick walls are as deliberately untrendy as its location in a Midtown office building. New York gallery spaces are as mobile as their merchandise, and just as prone to the vagaries of fashion. The galleries and their contents have been migrating around Manhattan since the 1950s, from Madison Avenue and 57th Street, to Soho, the East Village, Chelsea, and beyond. As always, the business has been coyly, un-commercially commercial, in its interior architecture as much as in everything else. The Duveen story points to the complicated relationship between art and real estate, shaped by who’s buying and who’s selling which particular kind of art. 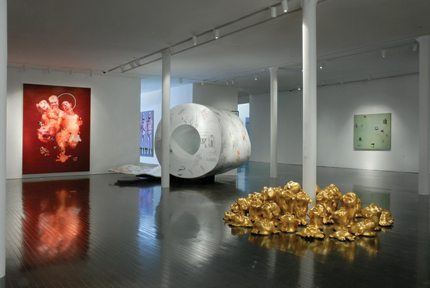 Architects became players in the equation in the1980s during the contemporary art boom, when galleries multiplied in Soho and dealers wanted interior spaces that would reflect, even justify, the kind of money in play—better than the East Village squats where the artists had been living and the party spaces where they showed their work. When architect Richard Gluckman came on the scene, he established the look: smooth-walled, high-ceilinged volumes in buildings with a stolidity not found in the East Village. hangs in the hallway (above). As rents ascended, most of the art trade fled Soho for Chelsea, where Gluckman went on to define the look of that district’s galleries as well. In the hodge-podge of warehouses, industrial/commercial buildings, and auto-repair shops, the concrete slab floor was the norm. Spaces tended to be wider and even more unadorned than in Soho, which fit the massive scale of the art being made: installations and large-format photography. Entrances could monumentalize the old single-story garages and workshops that the galleries now occupied, creating a kind of neo-Bauhaus effect. Wide, ground-floor windows played with transparency. His clients and their sepulchral interiors (Gagosian, Cheim & Read, Andrea Rosen, etc.) are still there, and elements of Gluckman’s work have found their way into the museums he has designed, not to mention into the galleries designed by most other architects. What’s next? The most closely watched art space in New York right now is Haunch of Venison, the London gallery whose New York branch is now installed at 1230 Avenue of the Americas, on the 20th floor. Guards in the office building’s lobby issue tickets that get you into the elevator, and guards inside the gallery watch your every move. 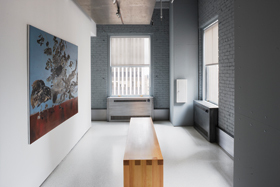 The space opened in the spring with a show of works by Donald Judd, evoking the artist’s spare studio. “It’s the closest thing I’ve seen in New York to Marfa,” said one dealer. Stripped down to corporate minimalism by its architect, Steven Learner, the gallery now looks like a business suite, where the elite works receive the best exposure—what architects like to call the “money wall”—and lesser-known artists are relegated to corridors. Cold and calculating would be an understatement. The space is subdivided by white panels to show works of abstract expressionism by Pollock, DeKooning, Rothko, and other artists whose work the gallery wooed away on loan from museums and private collectors. None of the work is for sale (the guards are evidence enough of their value), but it is the kind of art that high-flying buyers could very well find at Christie’s, the auction house nearby that owns Haunch of Venison. The power space is selling its power connections—with a painted white brick wall left as homage to Ab Ex painters who toiled in poverty and drunkenness far from Rockefeller Center. Perhaps it’s no surprise that the gallery’s director, Robert Fitzpatrick, put in a stint as head of Euro Disney. By forsaking Chelsea, where most of the art in New York is, Haunch of Venison is deliberately adopting a different profile from the multitude of dealers there. With paintings displayed as if an auction house were exhibiting a corporate collection (minus the wall labels), the gallery is flexing its business muscle. So far, midtown won’t be stealing any more business than usual from Chelsea. Arario Gallery opened on 25th Street in the spring with shows of work by Asian artists, the most significant new infusion into the global market today. Its new space, designed with a hand from British architect David Adjaye, sprawls horizontally through 7,000 square feet, with walls painted blue and red, departing from the monochromatic norm, for a new exhibition by Indian art-star Nilani Malani of huge panels that look back to the violent division of India in the late 1940s. Black oak floors by Adjaye, who is designing a museum for the gallery’s owner in Korea, help to silhouette sculpture and installations. The floor color gives the effect of a performance space when Malani’s multicolored images are projected onto the walls, accompanied by music. 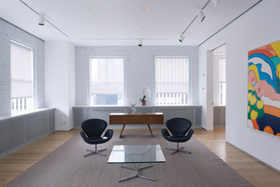 In Chelsea, black oak floors give the Arario Gallery the look of a performance space. With an eye on the future, Arario Gallery’s owner, Ci Kim, has only a ten-year lease on this vast, versatile space that can accommodate multiple exhibitions or a huge group show, or even a massive, single-artist retrospective. Yet when the lease expires, Chelsea could no longer be the neighborhood of choice for galleries, as residential buildings are already crowding in at the edges and driving up rents. Some Chelsea dealers are already looking east to the Bowery, where the New Museum of Contemporary Art opened its eight-floor building last winter. One Bowery newcomer is Lehmann Maupin Gallery, which took over a glass repository at 201 Chrystie Street, just south of Stanton Street, around the corner from the New Museum. 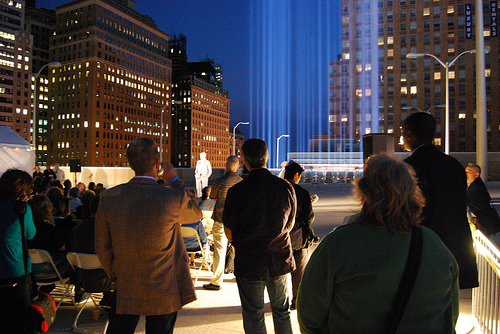 Through a dark passageway, visitors pass the pro forma desks and enter a 26-foot-high gallery that the building, seen from outside, could hardly seem to contain. Installed with Jennifer Steinkamp’s cascading video of flowers twitching in a breeze, the gallery (like the New Museum) has a verticality rarely found in Chelsea. 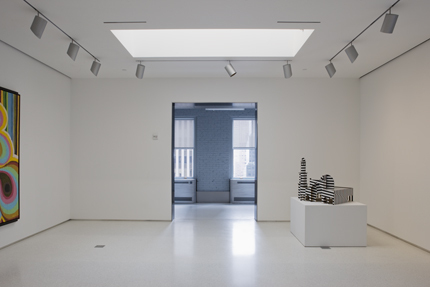 The space seems right for elaborate sculpture and installations by Do Ho Suh, a Lehmann Maupin artist, yet galleries that opt for the neighborhood may find themselves installing work in small spaces on multiple levels. (In the 1800s, dealers in galleries nearby would “sky” paintings all the way to the high ceilings.) Here, space seems likely to dictate architectural style—the high-rise gallery. Will it dictate the art inside, as well? The Aicon Gallery opened in September on the Bowery. The strategy might be called lobby-tecture, and the latest example is The Forum Gallery, which has set up Forum 57 in the north lobby of the Four Seasons Hotel on 57th Street, filling a once-neutral concrete-walled space with American paintings and a sculpture or two. Forum 57 isn’t just selling limited inventory on view 24 hours a day, like an art fair that never closes; it’s selling itself, offering an “art concierge” service to hotel guests, who tend to be some of New York’s wealthiest visitors. The gambit evokes a sly element that architect Arata Isozaki tried back in 1992 with the design of the Guggenheim Soho, where visitors were required to pass through the gift shop to enter the galleries. Much of the art of that era has disappeared, as has the Guggenheim branch itself, but at least one aspect of its commercial spirit has survived. 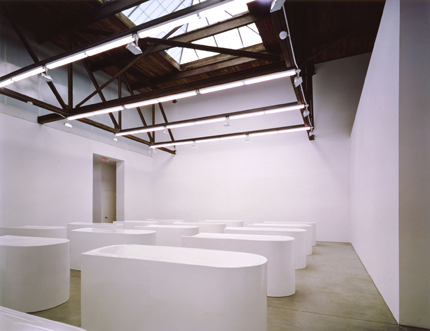 Richard Gluckman's Luhring Augustine Gallery established the bare but monumental look for art spaces in Chelsea. No architect did more to establish the language of the pristine gallery than Richard Gluckman of Gluckman Mayner Architects, whose high points include Gagosian in Chelsea and the Andy Warhol Museum in Pittsburgh. The gallerist David Maupin of Lehmann Maupin Galleries wanted a different kind of gallery space in Soho and invited his friend Rem Koolhaas to design it. Both Gluckman and Maupin have kept moving, though, to different scales and different neighborhoods. David D’Arcy recently sat down with the two to talk about what makes a gallery a good place to show artwork. David D’Arcy: What forces are driving the gallery scene now: the market, the clients, or the artists? Richard Gluckman: Market forces, for sure. Of all the galleries I designed in the 1980s—something like 25 of them—every single one is gone. A lot of the spaces are now clothing stores. Art, as Jeff Koons keeps showing us, is a commodity. DD: Another major evolution in the art market has been the rise of the art fair. A huge number of people are passing through them and see art in very small, undesigned spaces. Has that had an effect on the ways galleries look? David Maupin: Art fairs have had a huge impact as to how we function as a gallery in the physical sense. Because so many curators, writers, and collectors go, we have to participate in at least four of them a year. But art fair spaces are horrible—the walls are very flimsy and the lighting is often ghastly. The Shanghai Art Fair had particularly bad conditions. This makes it even more important that when artists show at a gallery, they feel that they have a space they can control. DD: That brings up another issue: Gallery space today has to be able to adapt to so many different types of work. 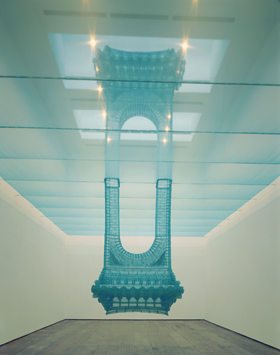 takes advantage of verticality to show Do Ho Suh’s Reflection (2004). RG: Flexibility, or rather having a variety of differently scaled rooms, is the key right now. The reason we were so successful when we got started was because we created, to a certain degree, a presentation of space that matched artistic production. The nature of the space related to the kind of large, site-specific work that minimalist artists were doing in the 1970s and early ‘80s. In the last 25 years, that parameter—where the nature of the gallery relates to the nature of the work—hasn’t been really continuous. For better or for worse, the gallery model we helped to develop—the industrial space, the concrete floor—isn’t necessarily valid for new kinds of art. The nature of the space didn’t truly shift as younger artists started doing installation and video work, and with a few exceptions, the commercial galleries didn’t try to design spaces to accommodate the newer kinds of work. Right now, I see another shift back to large-scale spaces, driven primarily by the incredible installations that Chinese artists are doing: In China, they can have a 10,000-square-foot warehouse space for 500 bucks a month. DD:Was the jump from Soho to Chelsea about finding bigger space? RG: Sure, it was about space and scale but also about rent, of course. Spatially, they are very different. Soho was characterized by 19th-century structures with heavy, timber-filled lofts, spaces that were a lot like the ones the artists were working in. They already understood the dimensions of the 20-foot structural bay. But in Chelsea, galleries moved into 20th-century or even postwar buildings that were often a single story with spans of 100 feet. 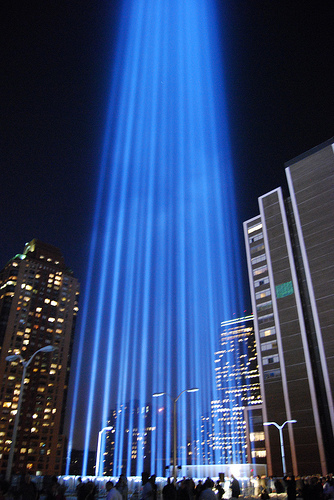 Many were on the ground floor with top lighting. But it is just a matter of time before all that type of real estate is gone and the galleries move on to the next neighborhood. DD: David, you moved to a big space on Chrystie Street right behind the New Museum. 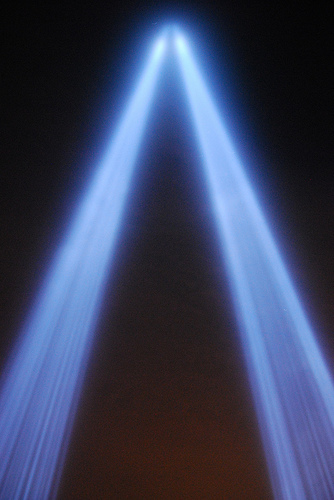 Do you think there are a lot of buildings with volumes of that scale on the Lower East Side? Do you think that it will be the next art neighborhood? DM: There were a few, and we certainly had more options than we did when we moved to Chelsea in 2001. But I don’t really think in terms of real estate; the New Museum was the trigger for us, and I’ve heard that Sperone Westwater is moving, too. But it’s really the Bowery that people are interested in, not the Lower East Side, because the buildings there are a little more like Soho buildings in scale. 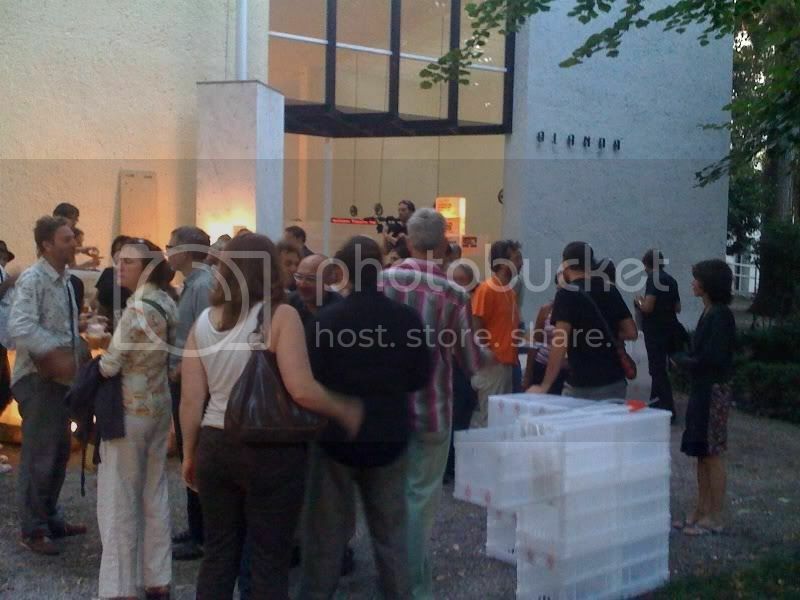 DD: Does space have something to do with artists migrating from one gallery to another? DM: Absolutely! It can make the difference. Artists want everything: They want natural light, they want artificial light, and sometimes they want no light—for video. They want no columns and then once in a while they want columns to hang a projector. I try to provide as many opportunities for my artists to show in different ways as possible. I don’t have natural light in Chelsea, but I do have it on Chrystie Street. You have to keep your artists interested and challenged. DD: So what does the space itself have to deliver? RG: Everything. The whole entity that is the gallery has to be flexible; it’s not just about individual spaces. In fact, we have to come up with a better word than flexibility; flexibility is a myth from the world of corporate interiors. Architects tend to want to develop the perfect modular system, but it’s not doable. Workstations are designed to be reconfigurable but then in five years, they aren’t reconfigured, they’re thrown out! Likewise, you cannot design a gallery with the perfect flexible wall system, and no artist wants it anyway. The whole institution has to be adaptable; the program has to allow for different kinds of work. For me it’s ideal when there are different spaces. The gallery has to be nimble: It could be as simple as going on the roof and putting a tarp on the skylight for video. Basically, there has to be a financial commitment to making space that can do what the space needs to do. Any smart dealer knows that and is interested in advancing the architecture along with the art. Despite almost all the talk at City Hall yesterday being dedicated to the electoral aspirations of Mayor Michael Bloomberg, the City Council still managed to pass an important piece of legislation that bolsters waterfront planning efforts, along with two other new laws that create a mixed-use development in Harlem and protect a small slice of affordable housing in Chelsea. From a planning standpoint, the first piece of legislation is the most impressive. It calls for the creation of a comprehensive waterfront plan, prepared by the Department of City Planning each decade, beginning in 2010. Back when New York’s waterfront was largely dedicated to commercial uses, it, along with the entire harbor, was overseen by the New York-New Jersey Port and Harbor Commission. Now, with the city finally returning to the waterfront with parks, projects, and follies, some two dozen agencies have taken a stake. 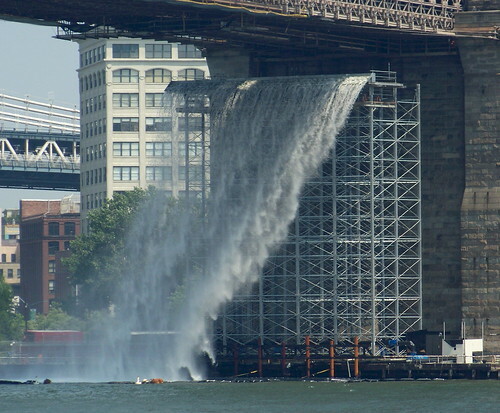 Under the legislation [text], which passed unanimously 51-0, the city’s planners must consult with affected local, state, and federal agencies, as well as the public, about their waterfront needs and how resources should be allocated to address them. For groups like the Waterfront Alliance (formerly the Metropolitan Waterfront Alliance), it is an important opportunity to finally weigh in on issues that might otherwise be ignored. “One thing near and dear to our heart is a working waterfront,” Roland Lewis, the group’s president, said. The council also endorsed a rezoning plan for yet another piece of 125th Street in East Harlem that will create a 1.7 million-square-foot, mixed-use project on three vacant city-owned parcels. Melissa Mark-Viverito, the local representative, said it was a landmark project not only in its scope, but also because the community rejected a developer three years ago, leading the city to take the incredibly rare step of rescinding its development contract. “Since then, we have worked hard with the community to come up with a satisfactory plan, something we have now achieved,” she said. Covering an area between 125th and 127th streets, from 2nd to 3rd avenues, the rezoning calls for a 30,000-square-foot cultural space, 850 apartment units (600 of which are affordable), a 98,000-square-foot hotel, and 250,000 square feet of office space. Also included are 500,000 square feet of retail space with an emphasis on local businesses, and a mid-block public plaza at the center of the complex. The council also passed a bill [text] modifying the J-51 tax benefit to include Penn South, a Chelsea co-op that was at risk of losing the benefit due to rising assessment values amid skyrocketing prices in the neighborhood. “By including Penn South in the J-51 program, we are taking the important step of preserving a community that is and will remain a source of affordable housing for thousands of residents,” Quinn said. 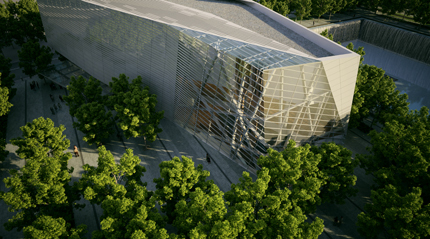 The great pursuit in glass architecture, and thus the technology that feeds it, is and has been for energy efficiency. More specifically, it is the elusive quest to design the most transparent building possible while at the same time mitigating heat gain and glare delivered by the sun. The failure thus far to achieve a balance between fulfilling this architectural ideal and creating an environmentally responsible and comfortable built environment was aptly illustrated by the recent backlash against glass condos. The Wall Street Journal ran an article this August chronicling a spate of horror stories from residents who didn’t anticipate what it means to live in a glass house at the beginning of the new millennium. The harrowing details included faded furniture, the impossibility of watching television during the day, peeping Toms ogling daughters, Windex sizzling to an impossible-to-remove gunk, and cooling systems unable to compensate for the unfettered glory of the sun. Aside from these issues of individual comfort and livability, it seems clear that, when looking at how we might reduce our overall carbon footprint, glass (our most ubiquitous contemporary building material) is a good place to start. A study issued by the Lawrence Berkeley National Laboratory (LBNL), a member of the national laboratory system supported by the U.S. Department of Energy, estimates that windows are responsible for 2.15 quadrillion BTUs of heating energy consumption and 1.48 quadrillion BTUs of cooling energy consumption within the United States annually, or 30 percent of building electrical loads nationwide. The same study estimates that an overnight replacement of the nation’s window stock with existing high-insulating glass technologies, such as low-emittance coatings and multi-pane units, would result in energy savings of approximately 1.2 quadrillion BTUs, while a similar upgrade to future technologies, currently under research and development at LBNL, could save a potential 3.9 quadrillion BTUs. Ever since the oil embargo of the 1970s, when energy costs went through the roof, the industry has been trying to make glass walls behave more like brick walls in terms of insulation values. This has been successful to the point that today people who have installed low-e solutions in their homes are complaining that when they sit in their breakfast nook in the morning they feel cold. The alternative to this approach is what is commonly known as “smart glass” or “switchable glazing,” in other words, a glass unit whose opacity or reflectiveness can be altered to deflect or transmit more or less of the sun’s energy, thus creating a dynamic barrier that can be optimally tailored to environmental conditions as they change throughout the day or the year. Smart glass has been developed in a number of varieties, including polymer dispersed liquid crystal, suspended particle, and electrochromic devices. Liquid crystal glass has become popular for privacy screening (it was famously used inRem Koolhaas’Prada stores), but it has no energy-saving benefits. Basically, two layers of glass sandwich transparent electrical conductors enveloping a thin layer of liquid crystal droplets. 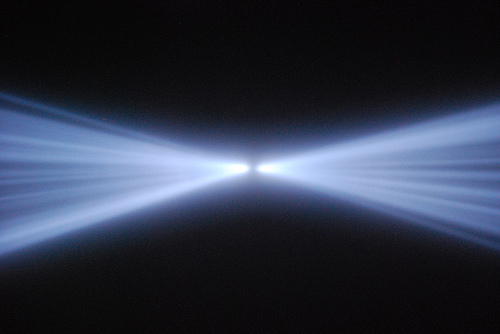 When in the “off” position, the liquid crystals scatter light, giving the unit a milky white appearance, but when an electrical current is applied the crystals align according to the electric field and assume a transparent state. The change between these two states is instantaneous and there is no middle ground between them. Suspended particle glass is almost identical in its assembly, except that microscopic rod-like particles, rather than liquid crystals, float in a fluid between the conducting and glass layers. Without an electrical current, the rods fall into random organizations and tend to absorb light, whereas when a current is applied they align to allow light to pass through. 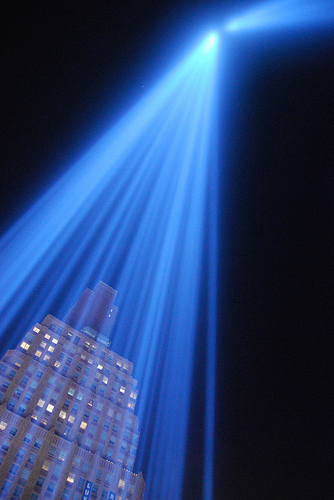 Unlike liquid crystal, suspended particle devices can be dimmed to allow more or less light and heat to pass through. Both of these systems require a small but constant electrical current to remain transparent, while the third system, electrochromic, requires a current to affect the change in transparency, but once that change takes place the current is no longer needed. This system is currently the focus of most smart glass research at LBNL. The system works by passing a burst charge through several microscopically thin layers on the glass surface, activating a layer of tungsten oxide and causing it to turn from clear to dark. The reverse change takes place when the charge is passed the opposite way. 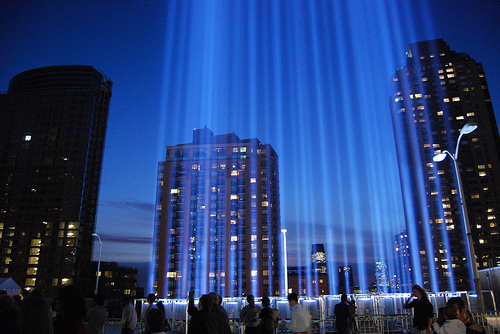 A mirror system has also been developed that transitions from clear to reflective. Electrochromic systems remain transparent across their switching range—between approximately five and 80 percent transmittance—and can be modulated to any intermediate state. Another sticking point, of course, lies with the architectural leadership, who will have to decide whether or not they’re willing to allow the external aspect of their buildings to be tossed about willy-nilly by the whimsy of occupants and the demands of the passing sun. Aaron Seward is an associate editor at AN. Trumpf, one of the world’s leading manufacturers of machine and laser tools, won’t open its 90,000-square-foot expansion in Ditzingen, Germany until mid-2009, but one can get a sense of what’s to come from the spectacular Gatehouse, which was designed by Barkow Leibinger Architects of Berlin and opened on the Trumpf campus in late 2007. 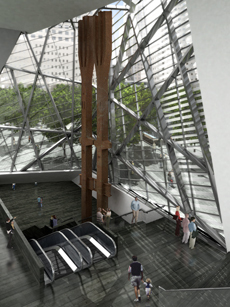 A honeycombed membrane of stainless steel cantilevers 60 feet over and floats above a 400-square-foot rectangular glass box that houses a reception and waiting area. The roof is a pattern of triangles that compress based on the changing structural forces over its surface. 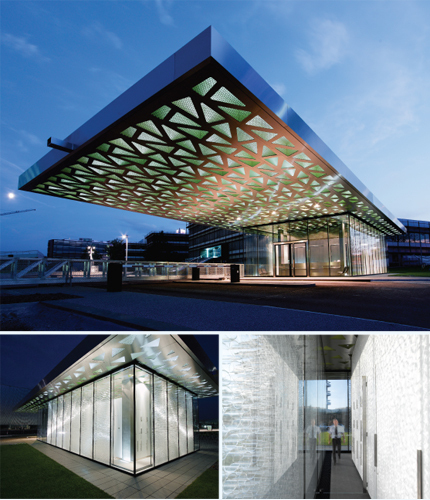 The roof, which was fabricated in-house at Trumpf, is an interesting formal experiment and a celebration of Trumpf’s advanced laser technology, but it is the Miesian glass box beneath that endows the sizeable overhang with its dramatic effect. 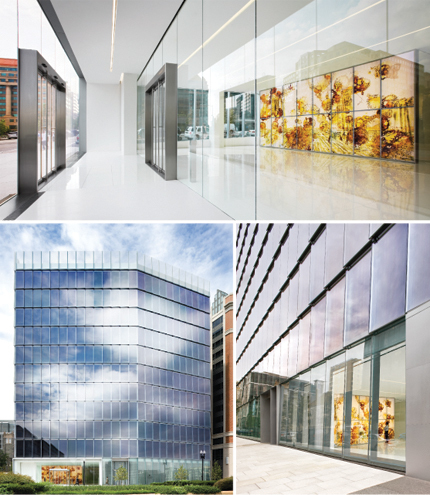 With engineering consultant Werner Sobek and manufacturer Glaszentrum Schweikert, Barkow Leibinger developed a 12-inch double non-bearing facade of two layers of low-emission float glass that gives the impression that the planar roof hovers in thin air. 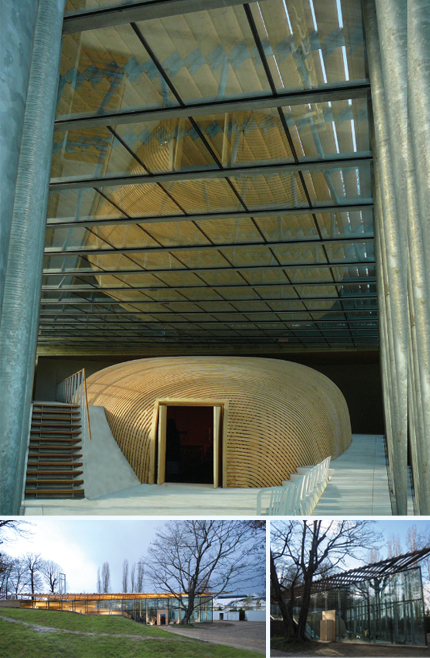 However, as Frank Barkow explains, the dynamic roof sits on a core of four columns inside the box while connected to the glass facade by an accordion-shaped rubber gasket that was developed by the team of engineers and architects specifically for this pavilion. Between the two glass surfaces of the facade, the architects stacked Plexiglas tubes of varying diameter, which provide subtle shading to the interiors. 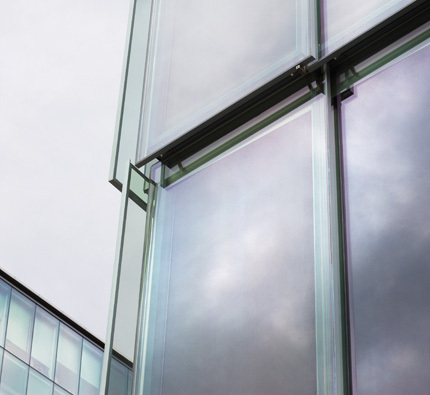 The team developed a custom detail of dark Plexiglas structural posts that run vertically between the glass sandwich panels, which are stronger than glass and make the whole facade read as a transparent plane. The interior glass panel is operable to allow for the occasional cleaning of the tubes, which are glued together for easy access. Together, the double facade, the tubes, and the screens lower the cooling costs of the pavilion. It is at night, when the honeycomb roof is lit by LED lights and when the Plexiglas tubes trap the light from the interiors between the layers of glass in an eerie-looking blurry effect, that the Gatehouse appears ready to drift off in a world of its own. David van der Leer is a frequent contributor to AN. 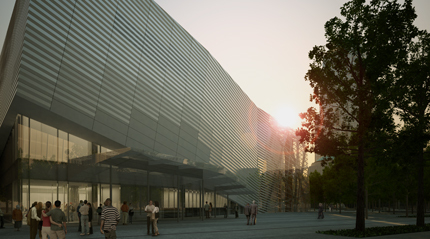 The buildings designed for the Beijing Olympics hardly lacked in spectacle, but New York architect Simone Giostra created one that is aimed more toward the gallery crowd than gym-goers. 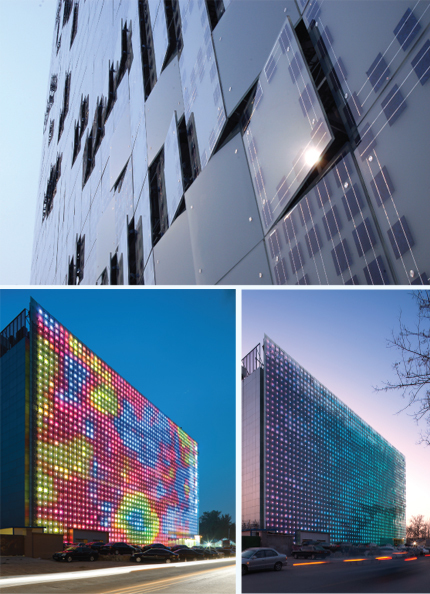 The 24,000-square-foot media wall called Greenpix, which covers the entire facade of the six-story Xicui Entertainment Complex, is an all-glass facade that collects solar energy during the day and gives off tantalizing patterns of vibrant colors at night. Unlike many similar (though smaller) media walls, typically used for display advertising, this one was created to showcase video works. For its opening, Greenpix’s lead curator Luis Gui worked with Shanghai-based curator Defne Ayas, who commissioned pieces by artists Aaaijao and Shi Chieh Huang of China, and Varara Shavrova of Russia. However inspiring it may be from an aesthetic perspective, it is the system’s sustainability that is of most interest to Giostra, who developed the wall in collaboration with Arup. Together with two German glass manufacturers, Schueco and Sunways, they created a technology to laminate polycrystalline solar cells into glass panels. “It is the most radical example of photovoltaic technology applied to an entire building envelope,” said Giostra. The solar panels have been embedded in the glass panels, some of which are set at an angle, in a pattern of varying density that depends on the nature of the spaces inside and their requirements for daylight. 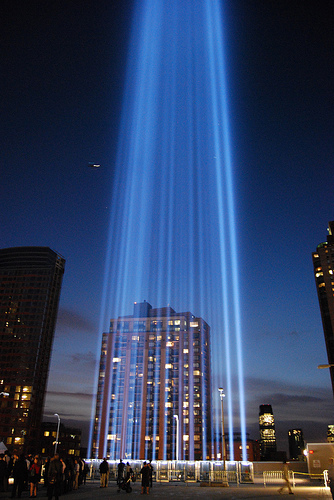 These solar cells provide energy to the roughly 2,300 LED light points, which are intentionally distributed at a lower resolution than generally used for media walls, contributing to the wall’s special abstract quality. With its strict height limits and bevy of bureaucratic institutions, the District of Columbia has long favored architectural harmony and conformity over innovative design. How refreshing, then, to see a commonplace glass-box office building raise the bar for design in the Capital without disrupting the city’s intended uniformity. Designed by New York-based Thomas Phifer and Partners, 1099 New York Avenue is an eleven-story, 173,000-square-foot office building, developed by Tishman Speyer, with a crystalline facade that expresses its materiality and, thanks to meticulous detailing, offers what Phifer calls a subtle “sense of surprise.” “Jerry Speyer wanted a special building with a unique skin,” said Phifer, “and he wanted to do it in D.C.” On first glance 1099 might look like a particularly well wrought version of the ultra-glassy office building— at times perfectly transparent, at others so reflective as to nearly disappear—such as SOM’s World Trade Center Seven. As you get closer, however, you see that rather than striving for a pure planar surface, Phifer has created something, literally, more multifaceted. Rather than using a curtain wall system, Phifer opted for a custom window wall over the building’s thin concrete frame (Washington’s height limits make ultra thin floor plates a must). Each pane of glass is tilted six inches in both plan and section, giving the building a sense of depth and shimmer. 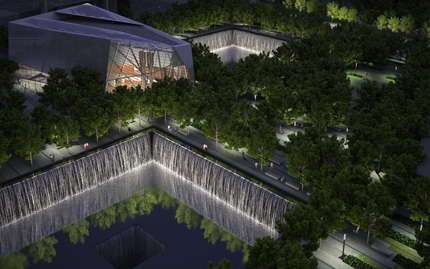 “We wanted it to be a detail, rather than a gesture,” Pfifer said. “If it had been a big gesture, that would give away the sense of surprise.” A cast stainless steel clip, visible from below, supports the pane. “The clip expresses the weight of the panes.” The five-inch deep by eight-inch long clips also add to the texture of the facades. The large twelve-and-a-half-feet long by five-and-a-half-feet wide low-emission Viracon panes function like shingles, allowing water to run down and drip off the facades during storms. At ground level, an installation by artist Matthew Ritchie helps enliven the streetscape. The building, which follows the contour of the lot where the Washington grid is bisected by a diagonal avenue, responds to its site, respecting its context while showing that even a small speculative office building, with the right attention to detailing, can reflect higher ambitions. Alan G. Brake is an associate editor at AN. 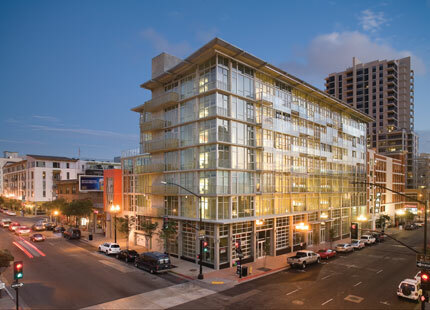 Lofts @ 655 6th, a seven-story, mixed-use project that opened last December on the edge of San Diego’s East Village and Gaslamp districts, uses an innovative glass system to distinguish what is a fairly simple structure from the city’s many other new residential buildings. The project is one of the few new rental properties in a city awash in high-end condos. 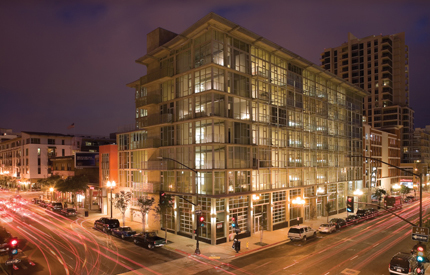 In order to save money, maximize space, and create a more authentic loft-like ambience than the traditional configurations that are dressed up to look like lofts, and which are so common today in San Diego, local firm Public built a huge concrete box at the core of the 106-unit building. 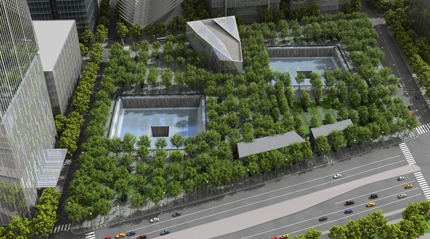 The 100,000-square-foot structure then steps down to the east to address the neighborhood. The infill glazing system cladding the core is made up of a varied pattern of small and large glazed squares. All are very transparent, but highly energy-efficient, with a U-value of .41. To further animate the facade, Public hung an irregularly spaced clear tempered glass screen system over the project’s west-facing balconies. The screen is fitted with a perforated vinyl film—similar to the films used to create many billboards—that displays a sepia-toned photo-abstraction of live oak trees, created by photographer Philipp Scholz Rittermann. Not only does the screen add complexity to the building, but its shading helped the building pass its state-mandated requirements for solar gain. When the film needs to be replaced in about five years, the firm hopes the developer will hold a call for entries to find a new artist, thus ensuring a new look for the building. “Our only agreement with the city is that the new image not be distasteful or commercial,” said firm principal James Gates. The building has been a hit, and is fully leased, despite being completed just prior to the recent economic doldrums. “We’re very proud of what we were able to get for the money,” said Gates. Sam Lubell is AN’s California editor. It only took a few hours—and espressos—to catch the jitters going around Venice the day before press opening. Since I was in tow with the Commissioner of the US Pavilion, our own Bill Menking, and crew it was a privileged view, but no less insane as architect elves, ie support staff, scurried around town trying to find that last minute acetate binder, glue gun, 6-color color printer etc etc. The big guns don’t arrive til later today or even tomorrow if they were not invited to Zaha Hadid’s super-dinner at Palladio’s Malcontenta, a powerbroking hour away, at least. (We heard that Thomas Krens was planning to rechannel some back canal in order to take a shortcut there). Aaron Betsky, the curator of the whole to-do, was troubleshooting from his post on a low wall outside the Italian Pavilion in the Giardini across a gravel path from the Dutch Pavilion, his old haunts. Ole Bauman, the current director of the Netherlands Architecture Institute, was nearby wondering if Rem Koolhaas might show up to see the Dutch Pavilion’s “Archiphoenix,” a research project as only the Dutch can do research projects on the educational implications for architecture on the fire that recently wiped out the Faculty of Architetcure in Delft University. (Hint: He’s won’t. Rem is headed for New York to unveil the design on Thursday for 23 E 22, his luxury high-concept carbuncle condo attached to One Madison Park). Bauman was hosting a kind of hallow’s eve party for all the worker bees from all the national pavilions (there are 32 of them) fueled by kegs of peach juice and prosecco, hummus, and pasta made by an imported organic Dutch chef. Benjamin Ball of Ball Norgues of Los Angeles was on hand happy and hyper about his string installation at the Italian Pavilion whose theme features 50 experimenters and 4 master iconoclasts. Betsksy was explaining what exactly that meant when a staffer whispered in his ear that some Gehry drawings weren’t fitting their frames and he dashed off….